Please join us either by registering for our team (walk with us - with or without a dog) or consider donating to one of our team members. Your donation is tax-deductible and our organization keeps 100 percent of the money we raise (after transaction fees). The money we raise will be used to help us continue preventing pet homelessness. With your help, we can continue offering FREE dog training and microchips to the community and provide a temporary safe haven for pets owned by victims of domestic violence. Our SNIP program provides spay/neuter services to low income families which utimately impacts the number of pets entering shelters. Our medical assistance program helps owners in financial crisis take care of the emergency vet costs for their pets. And of course, with your help, we can take in many more pets into OPIN's foster family, providing them with a loving and safe temporary home until a permanent home can be found. We realize the work we do for the animals is only made possible by you, our generous donors. Thank you! 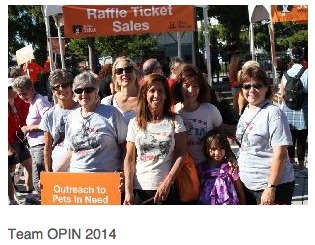 Please join "Team OPIN" or sponsor us as we walk in the 2014 Strut Your Mutt event on Sept. 27th. Your generous support helps us care for animals like Sal, who left us on Aug. 6th but, not before he finally knew what it was to be loved and cared for. Join "Team OPIN" Or Sponsor Us!